The Lumina Collection (including Lumina Encore) is the second listed collection (or line) of mattresses by Sherwood Bedding Group. This collection consists of six series: Pegasus Series, Spirit Series, Radiance Series, Brilliance Series, Cadence Series, and Opus Series. All models in this collection are innerspring mattresses with "high profile" (about 6") pocket coils with full foam encasement. Other features include "contract grade" insulators, to divide sections of the mattresses, and "Quite Lock" construction. The covers of the Lumina models have circular knit ticking. In the two Encore series, Cadence and Opus, the material used is organic cotton. Covers in the rest of the series are made of Lycra. Each cover is quilted to a "100% Natural and Chemical Free Fire Barrier" and layers of quilting foam. The quilting foams vary by model in softness, helping to determine the overall comfort level. These foams, like all others in the Lumina Line, are "soy-based" foams (see below). 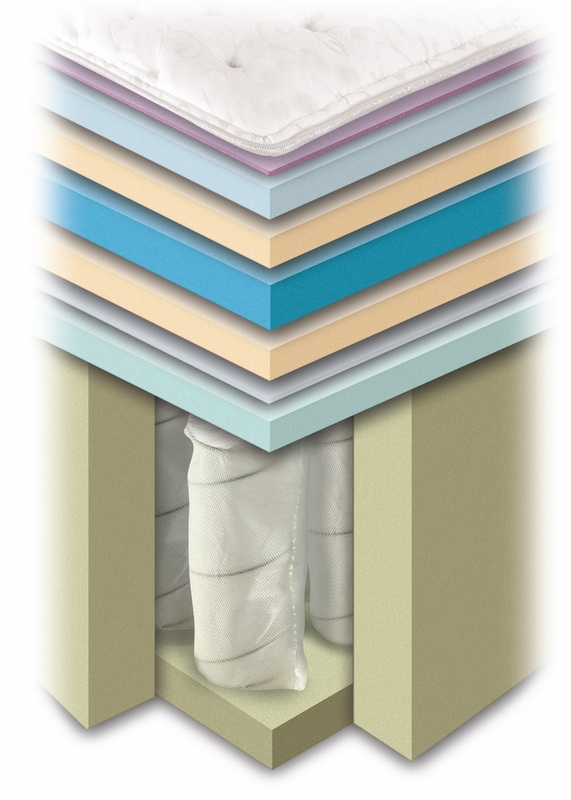 All Sherwood Lumina Collection mattresses have gel-infused memory foam and natural latex in the comfort layers. In two of the series, Brilliance and Opus, this is described as natural Talalay latex. By common usage of terms, "natural latex" contains some rubber tree sap (liquid latex), and may partly consist of synthetic rubber. "All natural" is generally reserved for latex (foam rubber) made of 100% rubber tree latex sap. All other foams used in Sherwood Bedding Lumina mattresses are "soy-based." This does not mean 100% soy-oil content, but up to 14-to-20% soy-oil polyols, with the rest derived from petroleum. The reason is that current foam manufacturing technology needs at least 80% petroleum derivatives for a durable product. A higher plant-oils content would make the foam more expensive to make, then add to the cost with an earlier need for replacement. However, the use of plant oils, such as soy, does reduce the use of petroleum and also enables the reduction of volatile organic compounds. Each mattress in Sherwood Bedding Group's Lumina Line has a thick base pad of high-density, highly-resilient base foam (polyurethane) to protect the pocket coils from below and act as a shock absorber. This works with the foam encasement, which protects the coils from the sides. The individually-wrapped pocket coils reduce pressure points by making the support even under the entire body. The independent response of each coil conforms the innerspring to the contours of the sleepers' bodies. This means the large body parts do not bear all the load, and points between receive needed support. So this configuration also is better for the spine. The independent response also eliminates transfer of motion as far as the innerspring is concerned (there will be some from the covers and the sheets). Lumina Collection models, like all pocket coil mattresses, require an essentially flat, firm foundation surface. Foundations that meet this requirement are platforms, closely-spaced (closer than 4") slats, and adjustable beds. Sherwood Bedding Group covers all the Lumina Line models with a 20- year warranty. These mattresses are available through several retailers, online and in stores coast-to-coast. I researched and tried several mattresses at different stores. I came back to this one and tried it again and then had it delivered and tried it several nights. It ended up failing :( I wish it would have worked as it's no fun returning mattresses and having to start the mattress hunt all over again. Initially when I tried it out in store, it was comfortable. It was also comfortable after it was delivered and I was able to sleep on it several nights. However, after only about a week, it was no longer comfortable. Not sure what caused it to quickly become uncomfortable perhaps something inside is not durable? Initially seemed fine but after a week was no longer supportive and could not remain in bed as long as I normally do because I was so uncomfortable and in pain in my back. Was this review helpful? 6 people found this review helpful.